Acer has introduced two new premium Chromebooks designed for business use – the Acer Chromebook Spin 13 and the Acer Chromebook 13. Both models feature a stylish and durable all-aluminum design and a full HD+ 13.5-inch display in a 3:2 aspect ratio. The new Acer Chromebooks are powered by 8th Gen Intel® Core™ processors providing exceptional performance and battery life for productivity on the go. The convertible Chromebook Spin 13 (CP713-1WN) has 360-degree hinges for use as a tablet, notebook, display, or in tent-mode. It comes with a Wacom® stylus (for pen input) that can be conveniently stored in the device slot. The Acer Chromebook 13 (CB713-1W) opts for the traditional notebook design for keyboard-heavy tasks. The new Acer Chromebook Spin 13 and Acer Chromebook 13 feature a 13.5-inch Full HD+ displaywith 2256x1504 resolution for 3.3 million pixels of brilliant clarity and vibrancy while running apps and viewing content. The IPS display lets users easily present projects and share content thanks to its wide 178-degree viewing angles. Productivity-Boosting Full HD+ 13.5-inch Display The new Acer Chromebook Spin 13 and Acer Chromebook 13 feature a 13.5-inch Full HD+ displaywith 2256x1504 resolution for 3.3 million pixels of brilliant clarity and vibrancy while running apps and viewing content. The IPS display lets users easily present projects and share content thanks to its wide 178-degree viewing angles. The Chromebook 13’s new design features a beautiful all-aluminum chassis that is visually appealing for professionals, students, or anyone who appreciates sleek, modern design. The attractive diamond-cut effects on the edges and surrounding the touchpad complement the sandblasted matte aluminum chassis, making it pleasing to touch and easier to grip. The Chromebook Spin 13 and Chromebook 13 are both built with a sturdy but stylish aluminum chassis to improve durability while reducing flex. The Corning® Gorilla® Glass touchpad provides smooth navigation when browsing the web and using apps, while dual microphones effectively pinpoint sound for clear audio during video chats and online calls. The Chromebook Spin 13’s convertible design with 360-degree hinges allows it to be opened a full 360-degrees so the touchscreen display can be used in tablet mode, useful for reading online content, gaming, or chatting. The convertible design brings the keyboard forward quickly for input. In addition, customers can stand it up in display mode to get closer to the screen, or use it in tent-mode in tight spaces. The new Acer Chromebooks have USB 3.1 Type-C ports on each side for charging the Chromebook from the most convenient angle. Plus, the ports can be used for quick data transfers when connecting to an external display or for charging other devices. Both new Chromebooks also have a legacy USB 3.0 port and a MicroSD card reader. The Chromebook Spin 13 and Chromebook 13 feature dual slot-antennae to provide fast and reliable 2x2 MIMO 802.11ac Wi-Fi, while Bluetooth 4.2 delivers a convenient connection to peripherals. The new Acer Chromebook Spin 13 can be used for a full day of work or school, streaming or gaming, with its industry-leading battery life of up to 10 hours2. The Acer Chromebook Spin 13 is powered by an 8th Gen Intel Core i5-8250U processor or Core i3-8130U processor. It offers up to 16GB LPDDR3 memory and up to 128GB of on–board eMMC storage. The Acer Chromebook 13 processor options include an 8th Generation Intel Core i3-8130U, Intel® Pentium® 4415U or Intel® Celeron® 3865U. It comes with up to 16GB LPDDR3 memory and either 32GB or 64GB of on–board eMMC storage. 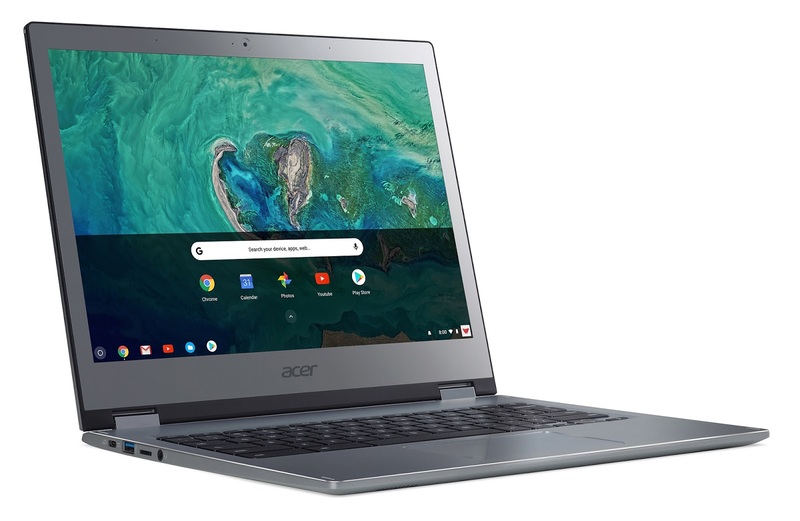 Both the new Acer Chromebook Spin 13 and Chromebook 13 fully support Android apps via Google Play, so customers can have access to Chrome apps and more than two million Android apps for productivity, connectivity, and fun. The new Acer Chromebooks are not only easy to use, but also easy to share with multiple users. Customers simply log into their Google account to access Gmail, Google Docs, apps, extensions, bookmarks, and more. Chromebooks run on Google’s Chrome OS platform, which automatically updates and uses multiple levels of security to guard against ever-changing online threats. The new Acer Chromebook Spin 13 and Chromebook 13 were unveiled today at the next@acer press event held in New York, where the company announced a range of new devices and solutions for gamers, creators, families, students and professionals. For more information, visit www.acer.com/nextatacer.